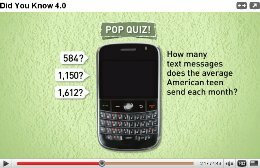 *Video* The Average Teen Sends How Many Text Messages Per Month? This is another official update to the original “Shift Happens” video. Their latest video “Did You Know 4.0”, shows some great information about how our world is being changed by technology and social media.